Depressed, but not interested in taking drugs to improve your mood? The American Psychiatric Association guidelines have listed (bright) light therapy as an option for seasonal and nonseasonal depression for years. Further, in 2016, this natural method for getting better gained unequivocal support from researchers who compared light therapy with Prozac (fluoxetine), and two placebos, at multiple study sites. Light therapy was extremely effective; Prozac and the placebos were not. Interestingly, light therapy and Prozac together worked best. This suggests that people can try light therapy first. That may be enough. However, if it does not work completely, they can add an antidepressant. A 2016 review of the literature concluded light therapy was effective with or without Prozac, and that the combination of the two methods had the most consistent results. Now that you know light therapy is backed by science, how do you begin? Here are six steps. Make sure you are depressed. Depression due to seasonal affective disorder, major depression, and bipolar disorder all qualify. Take the AutoSIGH, a free, confidential self-assessment offered by the Center of Environmental Therapeutics. This test will rate the extent of your depression, and give you feedback about the kind of symptoms you have―information that will be helpful to your therapist. 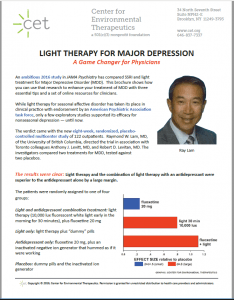 Read about light therapy at cet.org. Find out how it was discovered, the risks, and so on. Search the questions in our Ask the Doctor feature, and, if you do not see what you want to learn, submit a question. If you and your therapist agree on light therapy, take the free, confidential AutoMEQ. The AutoMEQ (Automated Morningness-Eveningness Questionnaire) will tell you the best time of day for you to start light therapy. The best time differs depending on the extent to which a person is an owl or a lark when depressed. Because timing is so important in making therapy work, it is not surprising that over a million people have taken the MEQ at the Center for Environmental Therapeutics website. If your therapist is not familiar with light therapy, make sure he or she has a copy of Light Therapy for Major Depression: A Game Changer. This free publication from the Center for Environmental Therapeutics covers the basics of light therapy for physicians and allied health professionals, and is accessible as a download here. The information in it will enable your therapist to tailor treatment to you. For example, instead of the usual thirty minutes of exposure to the light box in the morning, you may need only twenty minutes.Your therapist can also monitor you for side effects which, while usually very rare and minor, are possible. People with bipolar disorder should definitely be monitored for a swing into hypomania or mania, which, while uncommon, would require help. 5. Get a light box. You might want to record your mood daily to see how it changes. Some people are encouraged when they see daily scores because it makes them realize they really have made progress. Charting your mood daily year round also enables you to discover patterns. For example, you may tend to get depressed in the late fall and winter. This seasonal depression is Seasonal Affective Disorder, or SAD, if it is due to the shorter days (as opposed to stressors that may occur during holidays or other events). SAD depressions, or the winter blues, often tend to involve oversleeping, overeating, and carbohydrate craving. If you keep track of your moods and related symptoms, you will understand more about yourself, and be able to take care of yourself better.